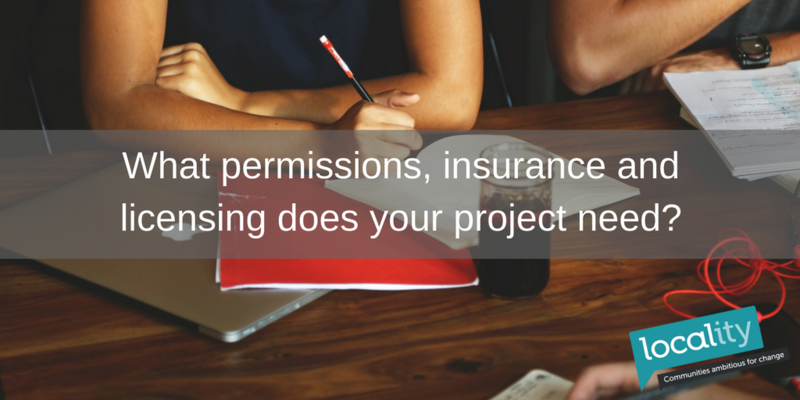 Creating a project in the public sphere means you have to make sure you have the right permissions, insurance and licenses to ensure that you, your project and the people who access it are all protected. But don’t let the paperwork put you off, we’ve worked with Locality to put together a guide to help you identify the documents you need to bring your project to life, so check out our list below to get started. Note: You will always need permission from the landowner of the space or building where you plan to carry out your activity. This could be part of an existing lease or evidence in writing from the landowner, confirming they are happy for the project to take place on their land. Does your project involve working with children or vulnerable adults? If yes – check to see if you will need a safeguarding policy and DBS checks. We recommend you check locally for organisations offering advice or guidance about safeguarding, and Disclosure and Barring checks. Does your project involve external building works or changing the use of a building or new signage? If yes – check to see if you will need planning permission. We recommend you contact your local planning authority/the lower tier council to find out what you need. Does your project involve running a public event? If yes – check to see if you need to acquire an events license also known as a temporary events notice; permission to close a road e.g. for a street party; the appropriate insurance. If you will need to close a road, contact the office of the local police and crime commissioner for advise. Insurance is key especially if you are using contractors to set up/break down, public liability for those attending, etc. Chat to an insurance provider about your insurance needs. Does your project involve selling food or alcohol? If yes – check to see if you need a food preparation and serving licence as well as a licence to sell alcohol. You can apply for these from your local council and/or local licencing authority. Does your project involve running sports activities? If yes – check to see if you need a health and safety policy to avoid injury or accidents and make sure you have appropriate insurance in place. Does your project involve volunteers? If yes – check to see how you manage volunteers, their health and safety and policies around paying expenses as well as providing appropriate insurance. Top tip: If you are a voluntary organisation/local charitable organisation, your Council for Voluntary Services in the area may be the best place to look for some guidance and advice. Does your project involve musical/live performances or broadcast/recorded music? If yes – check to see make sure you acquire an entertainment license along with the appropriate licenses from either the Performing Rights Society (PRS) or the Phonographic Performance Licence (PPL). PPL UK licenses groups to play recorded music at public events with some of the fees going to the recording artists and record companies. PRS for Music licenses groups to play live or recorded music at public events that is still in copyright, with some of the fees going to composers. Before any project can start crowdfunding on Spacehive it is verified by Locality – where they check the idea, land permissions, and project costs to make sure the project is viable and trustworthy. The verification duration varies depending on the project’s complexity – but most will take between three and five days. Learn more about verification here. By sorting out your paperwork and permissions in advance, it clears the way for you to create your project. And if you need any more support, get in touch at info@spacehive.com and we can help! Locality supports local people and community groups to improve neighbourhoods – making them great places to live! They can help you to manage community spaces – hubs, pubs and parks, and to develop your amazing ideas into community enterprises. Learn more at Locality.org.uk.